Cute chick holding an Easter egg, surrounded by flowers and a butterfly. Easter is love. Easter is the love of Christ and God our Father. Easter is the time to show love to all those who mean the most. 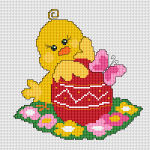 Cross stitch pattern of a cute chick in front of a colorful Easter egg. 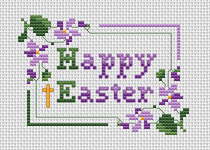 Christian cross stitch suitable for Easter projects. Stylized design of an Easter egg with violets, including the word: "Easter". Suitable for greeting cards and other craft projects. Stylized design of an Easter Egg with small violets,crosses and the text:"Easter". Composition of spring flowers on the background of the Cross.A cross stitch pattern for the Easter and other projects. Stylized egg with miniature flowers-violets and letters ХВ, meaning He is Risen in Cyrillic. 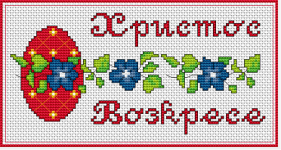 Easter theme cross stitch.Includes a red egg and flowers.The text in Bulgarian means:"He is risen". 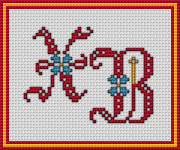 Easter cross stitch pattern with the symbols of Easter - a red egg,cute chicken and the text( in Bulgarian) "He is risen!" Cute bunny suitable for greetings cards or other Easter-themed projects.